with BCD with respect to rules established in the methodology and a pre-defined design problem (see section 3.1). culminating with a final presentation and critique. Jurors’ comments will be recorded and presented (see section 4.0). represented in Fig. 3.0.0 and will iterate multiple times. services: schematic design, design development and working drawings. FIG 3.0.1. Diagram of design process at macro level. critiques at various stages of the study working up to a final presentation and critique at the culmination of the study. FIG 3.0.3. Diagram of design process at micro level. 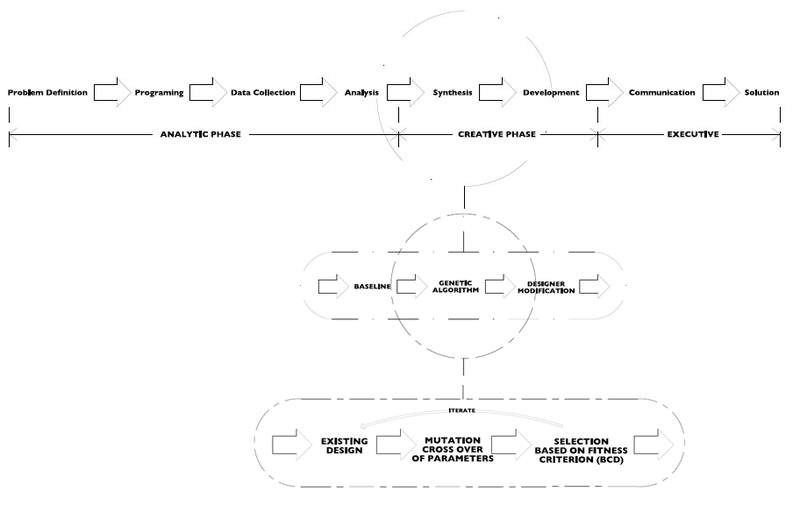 MICRO PROCESS: The algorithmic design phase unpacks further as a micro process within the mezzo process (Fig. 3.0.3). The micro process (micro-level) has a feedback loop which is the iterative design generations within the GA.
design as decided by the jury. on the expertise and knowledge of members. Comments will be recorded and included in chapter 5.0.